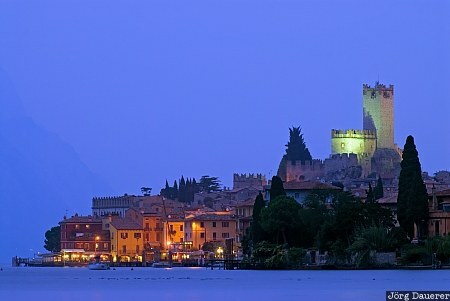 Malcesine at the blue hour dominated by its flood-lit castle (Castello Scaligero) at the shore of Lake Garda (Lago di Garda). Malcesine is in the province Veneto in northern Italy. This photo was taken in the evening of a sunny day in October of 2010. This photo is part of the exhibition Castles (June 2012). This photo was taken with a digital camera.